Great alternative for jobs where conventional swinging and sliding type gates would take up too much valuable space or simply will not work. 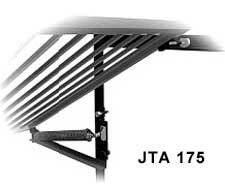 Allows an overhead gate or door to be lifted as close as 1" to the ceiling when fully open. 450 lb. capacity. Weldable attachments and bronze attachments. UHMW fully machined rollers for quiet operation.